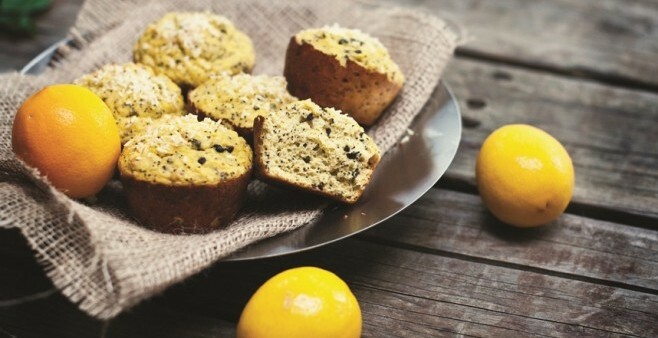 You’ll love the texture and the flavor of these lemon poppy seed muffins with coconut. These high-protein muffins are a nutritious creation that fit with a healthy gluten-free lifestyle. Preheat oven to 350° F. Grease a 12-muffin tin. In bowl, mix all dry ingredients. Evenly portion out the batter into muffin tin and bake for 20 minutes. Remove from oven and cool on cooling rack for 10 minutes. Remove muffins from tin and continue to cool on cooling rack. Baking time: 20 minutes. Cooling time: 10 minutes. Elizabeth Nyland grew up on Vancouver Island, on the West Coast of British Columbia, Canada, enjoying all the natural bounty her hunter/fisher/gardener parents could provide. She is the author of Cooking with Coconut Oil: Gluten-Free, Grain-Free Recipes for Good Living.